An Etihad pilot has been showered with praise after he aborted a flight on the runway at Manchester Airport so that an elderly couple could get off and rush to the hospital bedside of their dying grandson. 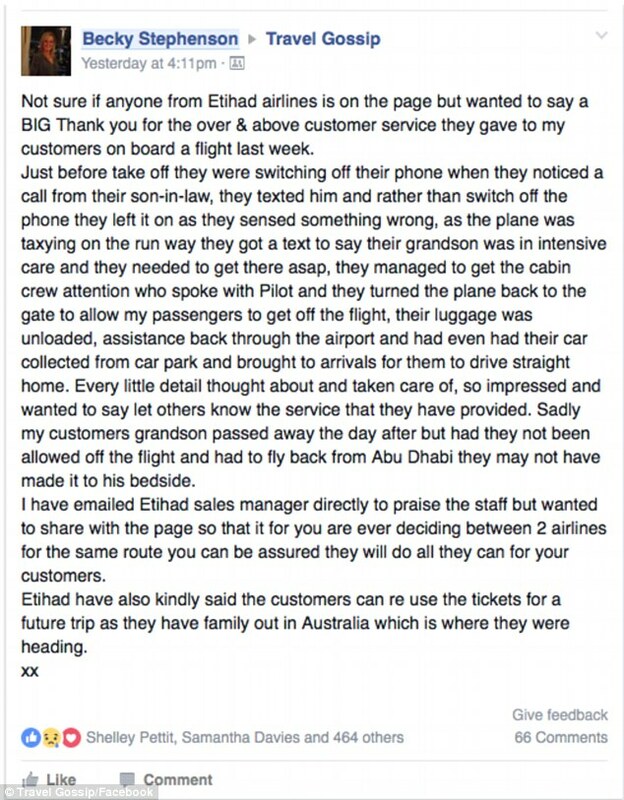 The couple were travelling to Australia via Abu Dhabi to see family members, and were about to turn off their mobile phone as their Etihad flight taxied to the runway when they received a text message from their son-in-law with the heart-breaking news that their grandson was seriously ill and had suddenly been rushed to intensive care in hospital. ‘They alerted the cabin crew who managed to get a message to the pilot, who then returned the plane to the boarding gate to allow the grandparents to disembark and collect their luggage. The couples Travel Counsellor Becky Stephenson who works in Bradford, UK, took to the Travel Gossip Facebook page to publicly thank the pilot for his thoughtfulness and consideration. ‘He took the decision to return to the gate so the couple could disembark, but not only that, the crew also arranged for the couple to be assisted at the airport and they even got their car delivered from the car park. The airline has received widespread praise for its actions on social media as every little detail had been taken care of. Sadly, their grandson died the following day, but the couple was able to see him thanks to the compassion showed by the airline staff. The couple was also informed by the airline that they can re-use their tickets to fly at another time to Australia. Stephenson said on her Facebook post that the couple, who did not wish to be named, were thankful to have had the chance to say goodbye to their grandson.